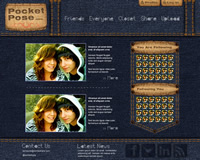 A web developer approached me to design a layout for a social networking site, geared towards teenagers that want to share their fashions. The idea was that youngsters could upload images of their outfits and get feedback on what their friends thought about them by “liking” the item (similar to Facebook) and through posting comments and suggestions. PocketPose gives you instant fashion feedback from your friends while you are shopping in stores and malls. 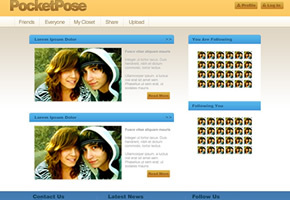 The design went through many iterations, including a denim-styled layout, before settling on this clean, web 2.0 site, which fits perfectly with PocketPose’s brand.